These are some of the designs I have created over the years. Custom sizes available. Click onto individual photo's for more information. Costs $550.00 to $5,000 and up. You may view coffee tables arranged by cost by clicking here. Most of the time I am busy with clients work. On occasion, however. I have time to create a piece and have ready for sale. If there are any; they are below and labeled " ship ready" , any. 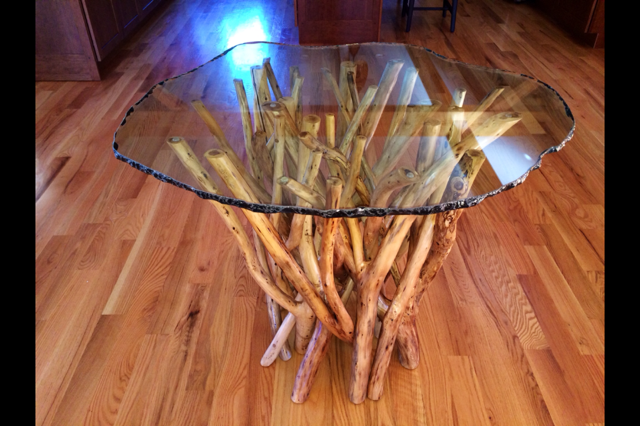 The coffee tables on this page were all created from a stump, log, or downed tree found in my area. 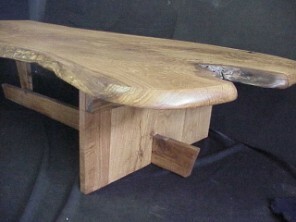 The Oak log table is from unique spalted logs. Spalting occurs on any log of about any tree. It is a natural decay process that, when halted at the right moment presents itself for creating beautiful natural tree furniture. I feel very fortunate when I find spalted logs as I know you receive some of the best and most unique furniture pieces in the world. 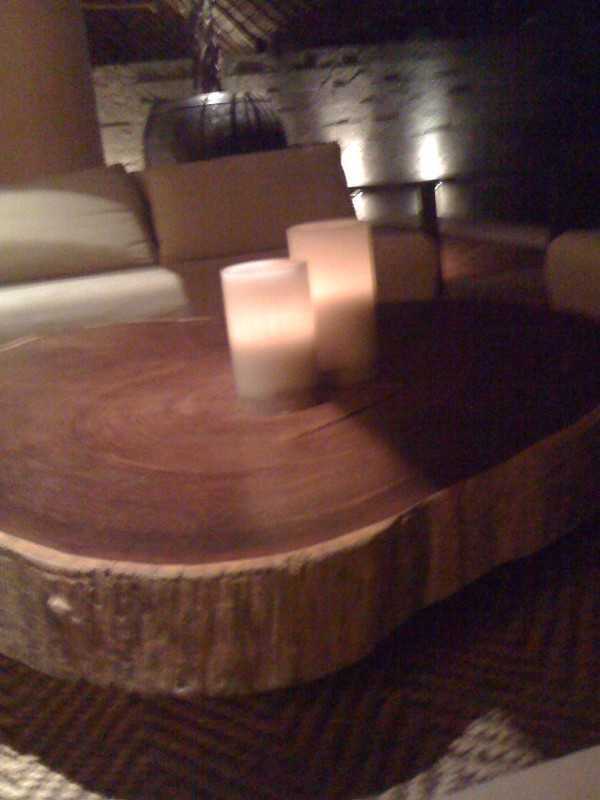 We do not cut down live trees to create tables. Rather, dead or dying trees. Our work starts at the creeks, selecting the most unique of pieces. Wood , with this character, is not available at typical lumber yards. 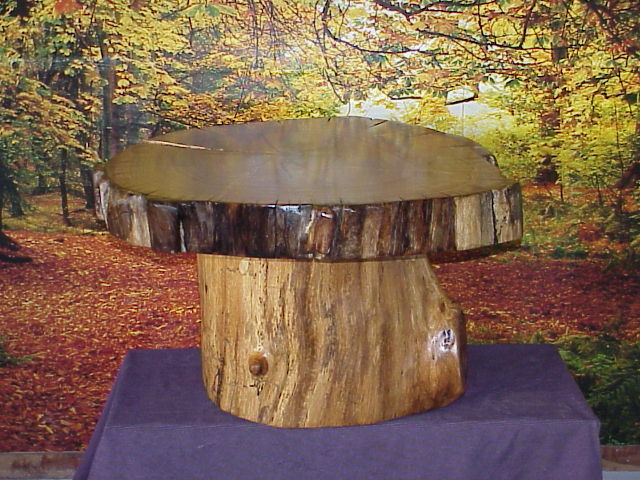 Many of the one piece top tables ( NO SEAMS ) has to come from huge logs. One would think, in Kansas? Yes, Kansas, the Oak where I live has grown slowly, the tree twisting and turning in the wind, creating the swirling wood grain. It has formed over a period of several centuries. (more about the tree) . Most of the tree tables you see above ARE of this Oak that grows here. Not to say the oak tree and it's logs is the best of woods but, it's pretty darned gorgeous! 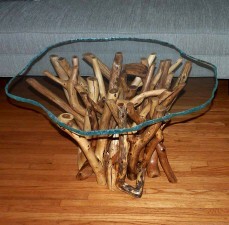 I also enjoy the wood of the Honey Locust tree and, it's stump is spectacular with curving roots. It makes wonderful root tables. Hope you enjoy our site as much as we enjoy creating these pieces for you. 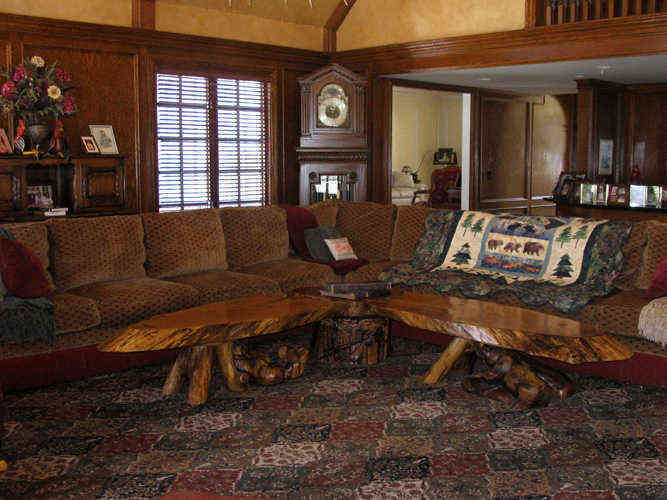 I want to thank my clients as it is they whom purchased and allowed me to create every coffee table you see here. thank you..
View coffee tables arranged by costs click HERE. 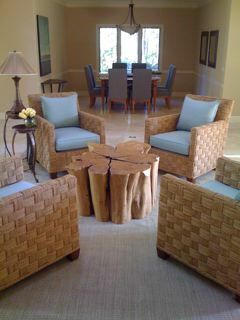 Stump and slab coffee tables. Most of the designs above have materials on hand and are available for order now. Read more about on hand material availability HERE . To order or ask questions, scroll down page. If you need a custom piece made, or any of the other pieces on our web-site, contact us and we will design it for you. The waiting period will depend upon the design but, we will give you a close estimate at the time of your order. Contact us for quotes and questions by calling ( 785 ) 658 3449 ( design shop ). Please refer to particular styles ( by table name ) that you may be interested in, approximate size or sizes if there is a group of tables. If you call and there is not an immediate answer, you may leave a detailed message. Shop gets noisy and I cannot always hear the phone. Leave your name, a return phone number, and email address if you wish. I like emails for the purpose of forwarding pictures or links to pages in order to confirm styles, tone, etc. Best of Regards. Look forward to visiting..
P.O. Box 413 - 2608 Ave E.
We Enjoy Bringing the Beauty and Grace of Nature into your home. One piece solid oak slab top. View matching side table HERE.